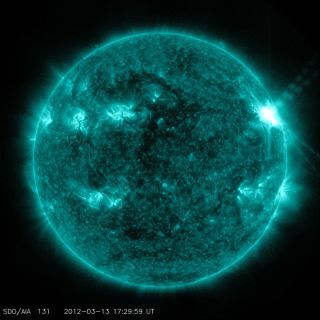 NASA's Solar Dynamics Observatory captured this image of an M7.9-class flare on March 13, 2012 at 1:29 p.m. EDT. The sun unleashed a new solar flare Tuesday (March 13) from the same region that has been actively brewing for the past week. The flare was categorized as an M7.9-class eruption and peaked at 1:41 p.m. EDT (1741 GMT) on Tuesday. While the outburst hurled a wave of plasma and energetic particles, called a coronal mass ejection (CME), into space, it is not heading in Earth's direction, according to solar physicists at the federal government's Space Weather Prediction Center, which is managed by the National Oceanic and Atmospheric Administration and the National Weather Service. "The Solar Radiation Storm promptly reached S2 (Moderate) levels, but now should slowly decline," experts at the Space Weather Prediction Center said in a statement. "A CME also occurred that appears to be on a path not towards Earth." Yesterday's flare is the latest in a string of eruptions from a giant sunspot region called AR 1429, which has been particularly active lately. This sunspot region has already unleashed three strong X-class solar flares and several weaker M-class eruptions. Last week, X-class flares from region 1429 triggered the strongest solar storm in eight years. Region 1429 has been rotating across the solar disk and is no longer facing Earth, astronomer Tony Phillips wrote on his website Spaceweather.com, which monitors space weather and skywatching events. Still, solar physicists will continue to monitor it and other developing sunspot regions for new outbursts. Space weather forecasters use five categories — A, B, C, M and X — to rank solar flares based on their strength and severity. A-class flares are the weakest types of sun storms, while M-class eruptions are considered to be mid-range, and X-class flares are the most powerful. If an X-class flare unleashes a CME that is aimed directly at Earth, it can cause geomagnetic storms as the energetic particles collide with Earth's magnetic field. Intense geomagnetic storms have the potential to disrupt power grids, GPS systems and satellite communications. Increased solar activity also typically supercharges the northern and southern lights for skywatchers at high and sometimes mid latitudes.